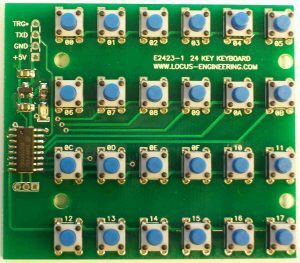 E2423 Decoded 24 Key Keyboard | Locus Engineering Inc. The E2423 Decoded 24 Key Keyboard provides a debounced 8 bit code with a 57.6 Kbaud serial output on the make of each key closure. The serial output is framed by a trigger signal being active prior to the serial output and de-activated after it is sent. A depressed key must be released before other succeeding pressed keys are recognized. An LED flashes each key closure and a typematic function is also included. The keys are on a 0.375”H by 0.625”V grid which allows for labelling space and the keyboard is easily mounted with #4 hardware or standoffs. Power input is +3.3V to +6V and the outputs are TTL compatible. Different button heights are available, please contact us for your requirements.